I'm pretty much of a live- and let-live kind of guy. When I see people doing something I don't approve of, I usually shrug my shoulders or shake my head and move on. If it seems silly or stupid, I suppress my chuckles until they can no longer be heard, and I file away a memory of the occurrence to include in some funny story to tell to friends. Live and let live, I say. Respect, or at least don't disrespect, choices that you would not make, as long as the choices don't inflict harm on others. The "Food Athletes" begin the hot-dog eating competition. Note the four rules of the contest. I had not planned to watch television that morning, but as I waited on a 11-year-old boy to eat breakfast and get dressed to go to see a parade, I decided to check out which baseball games were going to be telecast that day. The television was tuned to ESPN, and the announcer was breathlessly introducing the contestants for what was described as a momentous "professional eating" event. 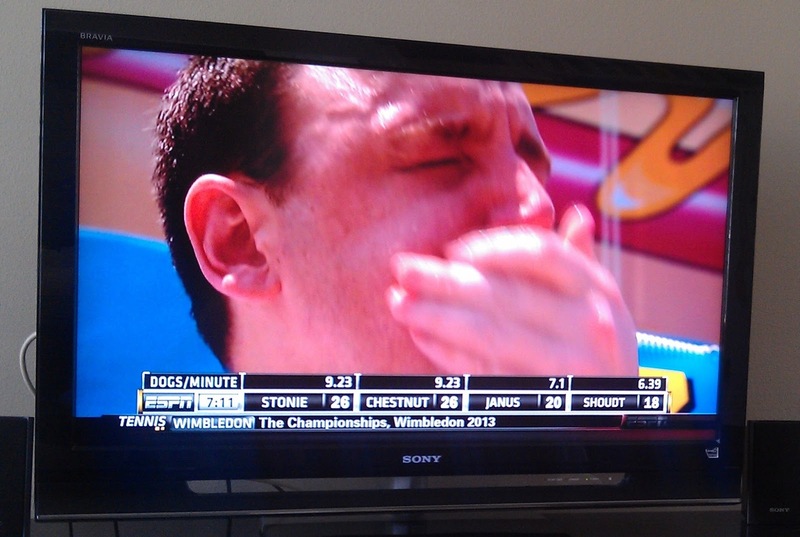 The commentator was explaining that Joey Chestnut had won the event the two previous years, and a third win would be a historic achievement. As I watched, the event started, and within a couple of minutes, I was yelling at the television, "Stop, please stop." Both I and the mother of the lagging eleven-year-old were watching, bug-eyed, the most awful thing I have seen on television. We could not keep our eyes on the television for more than a few seconds without wincing and turning away, but just as you HAVE to look when you pass the scene of a car wreck, we kept peeking back at the screen and saying things such as "yuk," "sick," "I can't believe this," "make it stop," and "I can't stand it." Truthfully, there is nothing enjoyable about watching sweating, grimacing men dunking a hot dog and a bun in water (no more than 5 seconds allowed) and forcing it, with a few cursory chews, down their gullets. From their expressions, it is clear that they are not savoring the gustatory experience. The event seems to have more to do with sword swallowing that eating. After watching this ESPN event, my customary tolerance was strained. I had to wonder how low a network has fallen to air such a sickening spectacle, which has, best I can determine, no redeeming value. I had to wonder about a society in which such events are popular enough to be aired on television. With the television off and the contest a bad memory, I drove with the 11-year-old boy and his mother to the Blaine July 4th celebration. The boy decided that he wanted to have lunch before the parade started at noon, so we found a booth selling old fashion American food. Of course, the boy chose to eat a hot dog for lunch. 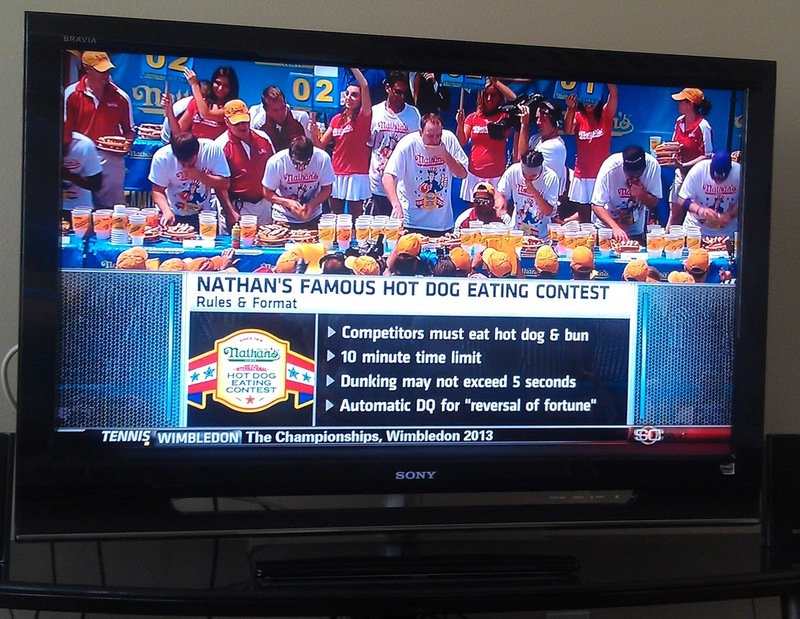 When I saw that, I almost had a "reversal of fortune," which would have broken the fourth rule of hot dog eating competition.